Given the meteoric rise of content marketing in 2014, it’s safe to assume this trend will continue to dominate the B2B and e-commerce landscapes for 2015. In fact, content marketing will remain a top priority for marketers, with 70% creating more content than in 2014, more than half planning to increase their content marketing budgets, and more than a quarter citing content marketing as the most important form of digital marketing. That’s more than twice those citing Big Data, the second-most important form. Here are eight trends that will help you dominate content marketing in the year ahead. 1. A clear-cut strategy leads to success. With increasing competition for the content marketing audience, B2B marketers will need to work harder to maintain effectiveness. A clearly defined strategy can provide a much-needed edge. Research shows that content marketers with a strategy in place rate themselves as more effective in achieving their goals. Currently, however, only 21% successfully track their ROI. It’s essential to define what you hope to accomplish. Who is your market? What kinds of information will they be looking for? How can you best meet their needs and succeed in reaching your goals? Without an established strategy, it will be nearly impossible to achieve consistent success. 2. Measurement will become both easier and more essential. A recent survey by The Economist Group found that 83% of marketers named lead generation as their primary goal for content marketing, and 84% use content marketing to create brand awareness. It naturally follows that “measuring content effectiveness” has been cited as the number one initiative of content marketers for 2015. Watch for new software to emerge, making measurement a great deal easier and more accurate. 3. Succeeding will require greater spending. There’s a reason budgets for content marketing are reaching record levels. After seeing the initial benefits of content marketing, many B2B marketers are increasing their investments for the coming year in hopes of achieving even greater returns. For those just entering the content marketing arena, higher budgets will be necessary just to cut through the competition from those brands that have already established a strong presence. 4. More emphasis will be placed on distribution. So far, content marketers have focused on getting their content published. In 2015, shift your focus to the distribution of content, as that will be where the greatest potential lies for improving results. Optimize search and build relationships with branded publications and other industry influencers. This will help ensure that your content reaches its intended audience. In addition, paid distribution via social media will spread content to a greater audience with the goal of generating new leads. 5. The shift from SEO to content marketing. With the rapid rise of content marketing, many have forgotten that it initially came about as a means of achieving greater search engine results. While SEO will continue to play an important role in the marketing mix, it will become more about keyword research, meta tags, indexing, and other technical issues. 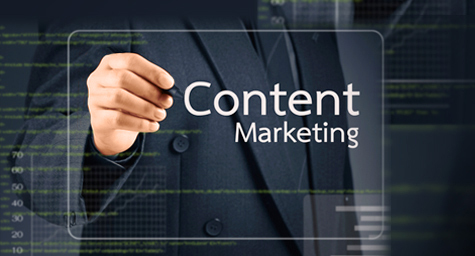 Content marketing will emerge as the key driver of rankings. 6. An increased use of visuals and multimedia. As competition for the content marketing audience increases, expect to see an influx of visually appealing data. Rich media offers marketers the opportunity to stand out in a crowded field. There are many ways to tell your brand story. Consider videos, podcasts, infographics, slideshows and shareable photos as possible solutions to more effectively reach your audience. 7. Email marketing will get a makeover. As email becomes less effective in motivating the audience and spam becomes more prevalent, B2B marketers will need to find new ways to engage an increasingly skeptical audience. Expect to see new techniques emerge as marketers struggle to get email recipients to open and respond to their messages. 8. Content quality will trump content quantity. Success in content marketing is all about engagement. Lots of content marketers push anything out there in hopes of connecting with an audience. Those who succeed put quality above quantity. Carefully analyze the types of content your market is searching for. Personalize your communications to their preferences. Make the right kinds of information easy for them to digest. And don’t be afraid to spend on the creation of quality content. Good content will more than pay for itself by breaking through the sea of sameness. Beware of the hard sell, however. Research shows that executives want content that’s timely and unique. Your focus should be on building relationships rather than on making a sales pitch. Market the content, not your products and services. Once you gain credibility and earn the market’s trust, the sales will follow. Discover the most effective content marketing trends. Contact MDG Advertising today at 561-338-7797, or visit mdgadvertising.com.